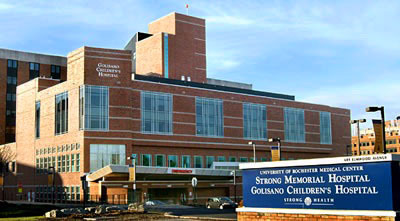 The Golisano Children's Hospital at Strong was named in honor of Tom Golisano for his generous financial gift. It is part of the University of Rochester Medical Center, which includes Strong Memorial Hospital. The Golisano Children's Hospital is one of the country's leading children's hospitals, as well as the only children's hospital in the region. They treat the most severely ill and injured, admitting close to 8,500 children each year. They have 60 regular inpatient beds; 12 PICU level beds, including a 4 bed post-surgical cardiac unit; and 52 NICU beds in the only Level 4 Neonatal Intensive Care Unit in the Finger Lakes Region. They also offer one of the country's few Ronald McDonald Houses that is located within a hospital.